I've been a Children's book and magazine author-illustrator for the last 30 years, publishing more than 45 books for the educational and trade markets. I typically work in watercolor, gouache, and colored pencil to do my illustrations. 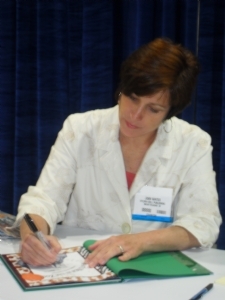 In addition to freelancing, I serve as the Mid-Atlantic SCBWI Illustrator Coordinator, and am a member of the Children's Book Guild of Washington D.C., and The National Art Educator's Association. Hi Joan, I am proud of you and your beautiful art work. I can't wait to show your work to my grand daughters, my nephews & nieces. Good luck with your new book that is coming out,nice art.